Once upon a time, almost 20 years ago, there was a young lady named Carol who lived in Chicago. She had a friend named Pamela who, with her husband, owned a duplex in one of the Chicago suburbs. They rented the upstairs apartment to a single father with a couple of very young children. The upstairs kids managed to acquire a little kitten. Their dad, who was not a cat person, said they could keep the new cat as long as they'd take good care of it. The kids, being young kids, took such good care of their new kitten, Tigger, that Tigger decided to take a run off a second floor balcony to escape them. This was a clever idea, and it would have worked perfectly if Tigger hadn't broken her hip when she hit the ground. 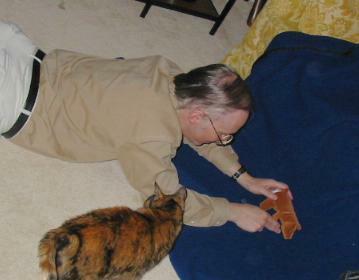 This resulted in a furball in a cast and Dad being given instructions to restrict Tigger's movements until the hip had healed. About a day into Tigger's convalescence, Pamela went upstairs to do landlady stuff and discovered that the Dad's best idea for restricting a furball's movements was to put it under an upside down plastic laundry basket. With no food, water or litter box. Thus ended Tiggers's days with that family. Her brief encounter with the family upstairs cemented her distrust of small children, but did not leave her emotionally scarred with regard to laundry baskets. At least, not ones full of warm, dry clothes. Pamela took the cat downstair to her apartment and blockaded her into the kitchen with some unused DEC Microvaxen (the first time someone has found a use for a MicroVax I). Tigger decided this was a distinct improvement over the two kids and she wouldn't even try to escape. Having her hip in a cast, and a couple pins embedded in her bones didn't really figure into this decision. About this time, Carol came by for dinner and borrowed a book. In the course of the evening she said hello to the pathetic little bundle of fluff and bandages and gave it a scritch. A few days later, Carol returned the book. As soon as she said "Hello" at the far end of a Chicago Railway Car apartment, Tigger recognized her voice and very nearly re-broke her hip trying to climb over the Vax-Wall to get to her. Pamela declared that Tigger had found her human, and Carol was obviously it. Carol declared that she already had one cat, and that was obviously enough. 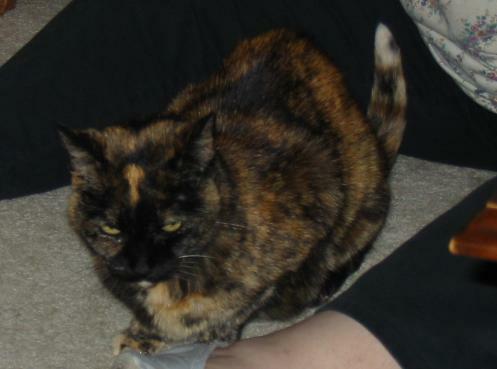 Tigger declared that she'd be very happy if Carol would hold her, scritch her and feed her Tuna, and she'd love to be the Cat in Carol's life and this was obviously meant to be. In the end, Tigger was Triumphant. Once she recovered she went home with Carol. As soon as Tigger got to Carol's apartment, she met Penny, the current cat in residence; no cute little half-kittens need apply. Penny had entered Carol's life when she attacked Pamela's 20 pound Tomcat and scared him so badly that Pamela declared a need to get this 8 pound terror out of the house. At that time, Penny was half grown, half starved, and half civilized. By the time Tigger arrived, 2 years later, she'd become fully grown, well fed, and barely civilized. Mothering a new kitten was not part of her instincts. To make a long story short, Penny and Tigger eventually came to terms, Tigger would defer to Penny on all matters, and Penny would let Tigger live. Until tomorrow. Maybe. Tigger came into Carol's life just as Carol was selling her co-op apartment and looking for a house to buy. While the apartment was being shown it was decorated with some lovely, flowing floor-to-ceiling draperies that looked brand new and perfect. The draperies were filmy, almost transparent and, needless to say, fragile. The second morning after Tigger arrived, Carol got up to go to work and discovered that Tigger had learned a new trick - "Look, Ma, I can run right up the drapes all the way to the top!" Tigger left for work with Carol that morning, by way of the Vet's office. Carol continued on to work, while Tigger remembered more about why she didn't like to visit a vetrinarian. A day later, on the way home from work, Carol picked up Tigger, now lacking her front claws and slightly spayed. Despite this indignity, Tigger forgave Carol. Tigger was so grateful to be taken away from the vet that she'd have forgiven the Marquis de Sade. As soon as they got home, Tigger displayed her affection by showing Carol her new trick again. Up the drapes she went. About 3 feet. Then suddenly, she went backwards and landed on her tail. She glanced back at Carol with an "I meant to do that" expression, and scaled the drapes again, just like she did yesterday, when she had claws. And again, landed on her tail. She looked at the drapes for a moment and contemplated them. Then, having taken their measure, dashed again for the ceiling. Another cocked head examined the drapes. Glanced at Carol to see if she were doing anything with the drapes. Checked the drapes again, and once more launched herself towards the heavens. Again, she failed to reach them. She did this several more times, while Carol laughed harder and harder. Tigger finally gave up, and decided that these drapes were obviously defective, and some folks had way too much time on their hands if they could waste it with such involved practical jokes on a poor putty tat. In time, the Co-op sold, but Carol had not yet found a house. She moved in with her folks while she looked for a house. Since her folks did not care for cats, Penny and Tigger were kept in the basement, and only got to see Carol when she descended into the depths of the dungeon to be with them. Neither cat liked these few months of captivity. Eventually, Carol found a new house, and as soon as the papers were signed, she, a sleeping bag and two cats moved in. There was no worry about Carol being chilled that night - it was a two cat night, with one on each side as close (and happy) as they could get after having to sleep all alone in a cold basement for so many weeks. Thus started several happy years for Penny and Tigger. 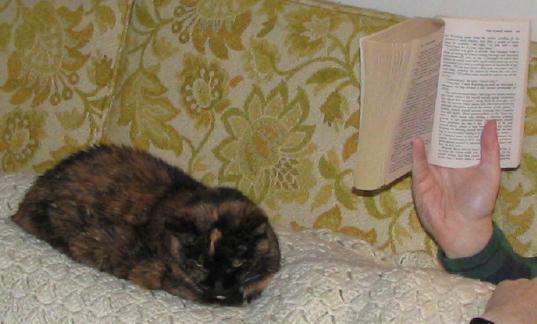 Carol was at home frequently watching television in the evenings with a cat in her lap, or she had small dinner parties with friends who would pet the cats. The only thing that would have made life nicer would have been if she had 2 laps. And perhaps a bit more tuna. Carols' house had 3 rooms and a hallway that shared a common wall, making a fairly long circular walk from room to room to hall to room. It turns out that a Two year old girl with a Two foot ribbon and a Two year old cat can walk for Two hours with the cat chasing the ribbon before they get Too bored and Too tired to continue. 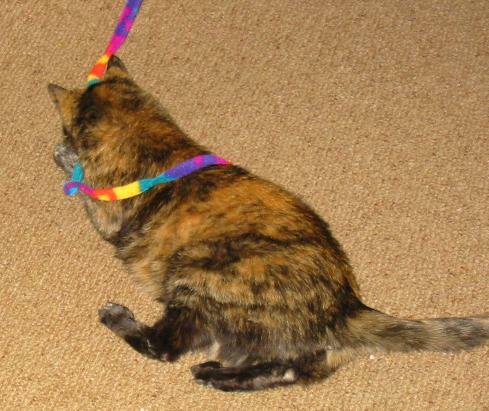 Ribbons were always Tigger's favorite toys. Whenever we got a present, Tigger got the wrapping paper and ribbon. Some ribbons lasted for a year or more before they were too bedraggled to be killed again. According to books, cats are easily overstimulated, and can only be petted for a few minutes before they've had all they can take. Tigger never read these books. Many cats feel that if you wish to give them the pleasure of a scritch, you should be inconvenienced in some way. Tigger never learned that either. Tigger's attitude was always that in an infinite universe, there is barely enough scritch to go around. As a kitten, she figured out that if it's easy to scritch the furball, the furball gets scritched more often. She was always willing to put herself in the proper position to make it easy for a human to scritch her. There might have been limits to how far she'd go for a scritch, but we never found them. One trick that Tigger never outgrew was the willingness to figure out where you are going, and be there first in an easy position to be scritched. In her first apartment, Carol had a hamper in her bathroom. Tigger quickly learned that being at hip-height was also being at hand-height, and this made it easy to get a scritch. So, whenever Carol was heading for the bathroom, Tigger would trot ahead, check Carol's bearings, and then leap for the top of the hamper to be there in time to collect a scritch as Carol walked by. One day, Carol decided to collect the dirty towels, clothes, etc from the kitchen and bedroom. So, she opened the hamper, and went to the kitchen to fill her arms with dishtowels, hand towels, and similar offerings to the gods of Laundry. As she headed for the hamper, Tigger realized that she was heading towards the bathroom. This means a scritch on the hamper! So, with frequent over-the-shoulder checks to be sure Carol was going to the right place, Tigger preceeded Carol. And then leaped to the top of the - oops - OPEN - hamper. She landed on the not-there top. Paused for a Warner-Brothers moment, feeling for where the top wasn't, and plummeted into the hamper. Like Tigger and the drapes, this misfortune did not discourage Tigger from attempting to figure out where you'd be next, and being in the proper location to receive a scritch. 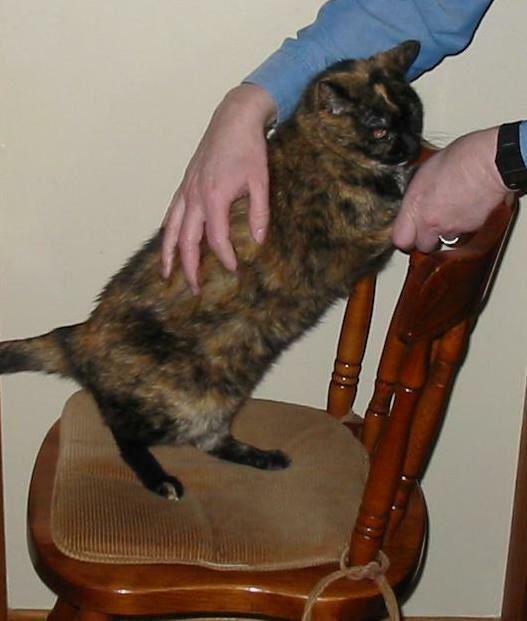 After Carol and I were married, and moved into our new house, Tigger discovered that if she stood on one of the dining area chairs, and put her paws on the back of the chair, she was in a good position for a nice, vigorous scritching. Whenever you stood behind a chair, she'd make a leap and put herself in position. 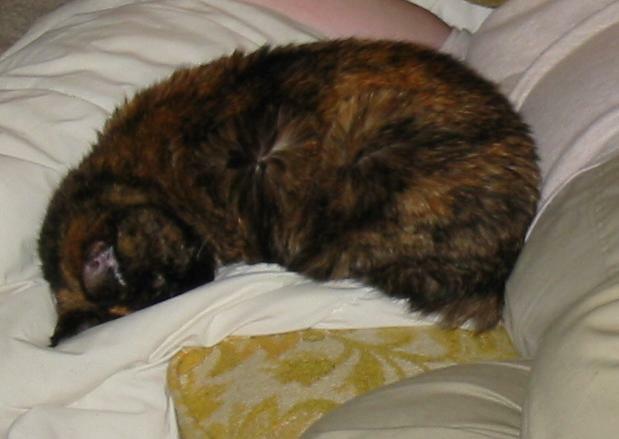 When we had guests, I'd pull out a chair, and, before Tigger could jump, tap the back of the chair (to get her attention), and say "Assume the position, furball!". Tigger would promptly jump onto the chair, arms and legs splayed for support, just like a punk up against a wall in a Clint Eastwood movie. Once, to amuse my mom (and get Tigger some exercise) I walked around the table tapping chair after chair, and Tigger gleefully bounced to each new chair to recieve a frisking (in the form of a down-the-side scritch). In her later years, this got harder, and she stopped being willing to "assume the position". I had to coax and hold her to get this photo. 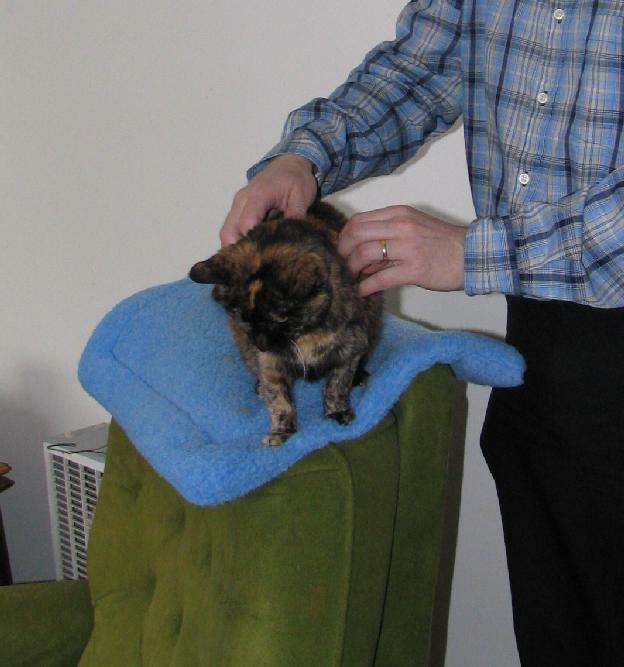 The only better spot for scritching was the back of Carol's overstuffed green recliner chair. In her old house, this chair was at the doorway between the living room and kitchen. Conveniently enough, it ended up in the same relative location in our new house. This being a prime spot for receiving scritches from people in two rooms, Penny promptly claimed the back of the chair as her personal territory. Tigger regarded this as a rule of life, not to be violated, unless Penny wasn't there to defend her turf. After Penny died, Tigger claimed this as her prime scritching spot. Whenever a conversation paused between kitchen and living room, you could depend on the brown blur bounding onto the back of the green chair to receive a scritch. I did not have to coax her to get a photo of her being scritched on the back of the chair. If you neglect to scritch the furball, she would gently place her head under your hand, lift the hand onto her shoulder and bump you with her head. While meeting with some co-students to design our class project, Tigger decided that one friend would scritch her. Now. She forced her way under his hand and butted against his chest with a fair amount of force. He described Tigger as "Agressively Friendly", and the monicker stuck. Part of the training Tigger and Penny got when they moved in with Carol was that they never ate off the same plate she used. They didn't beg at a table and they didn't beg in the kitchen. To drive the message home, Carol got 4 small cheap china plates at a garage sale that were very different from the plates she ate from. These were treat dishes for Tigger and Penny. Once in a while, just because the gods were feeling kind, Carol would open a can of tuna, make herself some tuna salad, and share a bit of the leftover tuna with the cats. On their very own, special, used only for treat, dishes. When we got married, Carol neglected to mention this little fact. So, in the first week in the new house, I decided to make myself a sandwich, reached into the cabinet, grabbed the first sandwich-sized plate I saw, and dropped it onto the counter. The Treat plates were a different thickness from the people plates. They make a different sound when they hit a counter. I suddenly had two fur anklets, looking up at me and crying "You promised! But, YOU PROMISED!" Carol, meanwhile, laughed herself silly and informed me that we *never* take those plates from the cupboard unless we intend to use them. Over the years, three treat plates succumbed to the laws of entropy, and we only had one treat plate. This wasn't a serious problem until we started giving Tigger twice a day medication and needed to clean the plate before giving Tigger the post-medication treat. We couldn't clean the plate before the medication, because that would mean the plate would make a noise, and Tigger would be underfoot demanding her dane-geld. Couldn't clean it after the medication, because once she'd endured the bad stuff, Tigger was ready for a treat, and she was ready *now*. So, a trip to Meijer's, and Tigger had some new Corel treat plates, that would last a good long time, even with daily usage. And, we could clean one dish while she was face first in her treat on a clean dish. Penny was a hunter. If it moved, she'd catch it. If it didn't move, she'd catch it even quicker. And, once it was thoroughly caught, she'd carry her kill into the bedroom, loudly voicing the victory cry of the Great Apes. Penny's kills included the usual mice, bugs and Christmas Tree ornaments, extended to kitchenware, and once even included a 5 lb bag of rice that had been accidentally left on a counter. Watching an 8 lb cat drag a 5 lb bag of rice across the house is a sight to be seen. But Penny was persistent. Tigger was not a mouser. She would sometimes watch a fly, and might even take a swipe at a moth, but mice were pretty safe from her. We don't know how much of her dinner she shared with the mice, but we found enough mouse nests lined with cat-fur and cat-food to get an idea. Shortly after Carol and I got married and moved into our new house, a mouse appeared in the kitchen, dashed for the basement stairs, and then crouched, scared silly, on the floor molding. We called for a cat, and got Tigger. "Look, Tigger, a Mouse!". We pointed at the mouse. Tigger, immediately recognized the pointing finger as an item that could scritch a furball, ran her head against the finger, and ignored where it was pointing. The mouse, realizing that opportunities like this were scarce, launched itself off the molding, ricocheted off Tigger's flank, and headed down the stairs. I met it at the bottom with a dessert bowl and trapped the mouse under the bowl. Tigger got credit for an assist on that mouse, but I take the point for catching it. 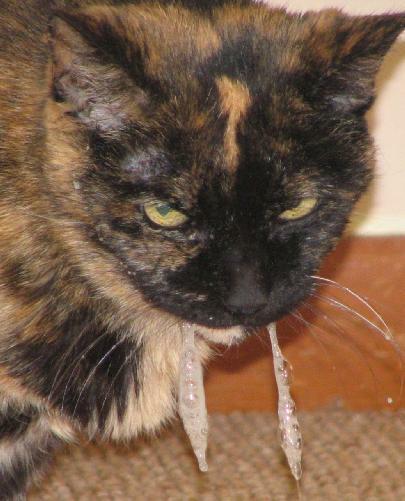 Tigger did manage to find one mouse that she could catch. One day, after I'd been doing some work in the basement ceiling, I neglected to replace several of the ceiling tiles. This left open spots about a foot square in the dropped ceiling. That evening I heard the gentle scrabbling of tiny mouse feet on the dropped ceiling. It was easy to trace the mouse by it's claws-on-accoustic-tile footsteps. I could almost watch the mouse run across the dropped ceiling, straight for the missing tile. The stupid mouse ran right onto the square where the tile wasn't and fell gently through the hole onto Tigger, who was sitting on the floor looking at the ceiling and wondering what that funny scrabbling noise had been, and why it stopped just when the mouse appeared. Penny was a hunter, but she didn't care much for playing. If she was going to exert herself, there would be a kill at the end of it. Tigger, on the other hand, loved to play. In her last years, she played less, but even when she was 19, if you brought out one of her favorite toys - the long ribbon, or the rolled up cardboard on some spring steel wire, she'd prance and yowl until the toy was ready for play, and would have a great deal of fun until she was tired. The first time I introduced her to a laser pointer, she ran in circles so hard chasing it that she got too dizzy to stand up. The laser pointer got old after a while, but the spring steel and the ribbons never did. Tigger had some attributes that were more doglike than catlike. For instance, she'd follow rules. When it was made obvious to her that she wasn't allowed in the guest room or Carol's office, she stayed out of those rooms. It was almost pathetic to see Tigger sitting just outside Carol's office while Carol worked. Her front paws would be just over the edge into Carol's office, while the rest of her was in the hallway. Slowly, over the course of weeks, she'd edge further into the room until her front legs were completely in the office, and Carol or I would call her on it, and she'd look sheepish, back up, and start inching forwards again. Eventually, Carol took pity on Tigger and changed the rules on the two rooms that she used and Tigger wasn't allowed in. This took some work, and lots of carrying Tigger into the room, making a fuss over her, and even making a special bed (spreading one of her towels on a chair) before Tigger would accept the new rule. Even then, we'd sometimes see her sitting at the doorway, not sure if she were allowed in or not. Tigger also wasn't allowed to beg while we were eating. If you said "Tigger, I'm eating", she'd leave the room (for a few minutes). This was easy enough in the kitchen/dining room, but a bit harder to enforce if we were eating in the TV room, where Tigger was allowed on the couch. Tigger didn't care for most programs, but she would perk up her ears if there was a cat crying on the TV. 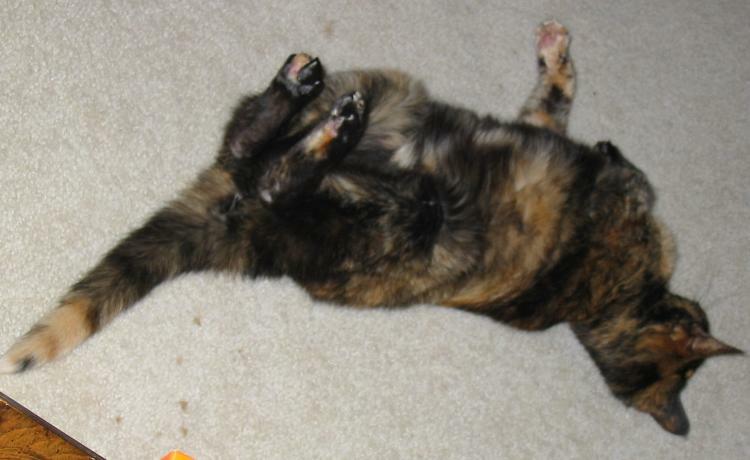 Tigger was also doglike in her love of a scritch. Rub her fur backwards, massage with fingertips, and all the things that a dog loves, and a cat will endure for a a few minutes, Tigger would revel in. She even liked being brushed, and hated getting baths. But, when it came to Catnip, Tigger was all cat. Fortunately, she was a happy drunk, Once she got ahold of some catnip, she'd float higher than a kite and have a grand time. Catnip was a very special treat. 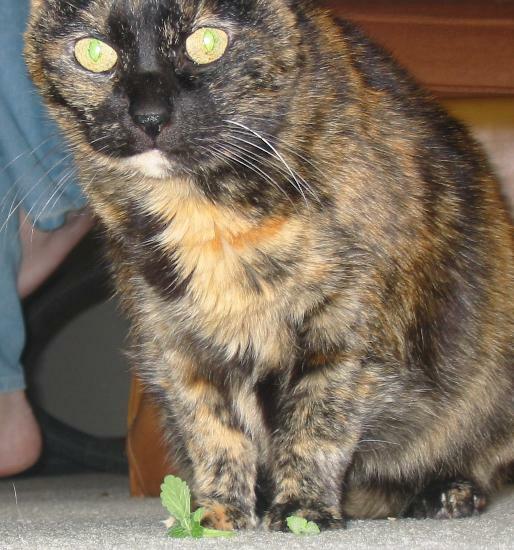 She only got fresh catnip once every couple of years. Once we started growing catnip in a planter, she got less interested in it. I suspect there was a low level of nepetalactone in the air all the time, and she didn't feel the need for more. Unless you crushed the leaves, and set them out for her. Possession is 90% of keeping your catnip, and Tigger would protect her leaf. Tigger was never afraid of work. At least, not work someone else was doing. One evening I had some time, and made a silly little stop-action movie with some blue-screen (Tigger's favorite blanket) and a beany bear. Tigger was more than willing to supervise this activity. At one point, I decided that music would soothe the savage beast and each cat should have her own theme song. Penny got the cat theme from Peter and the Wolf. If I whistled that she would ignore me and pretend I wasn't being so crude. But she'd calm down if I whistled this while she was at the vets or when we were giving her an insulin shot after she developed diabetes. Then there was the problem of a theme for Tigger. I tried whistling several songs: bits of Beatles tunes, The Cat Came Back, Big Band stuff and even Country Western, and finally, whistled "Send in the Clowns". On the, "Don't bother, They're here" line, Tigger came into the room, mewed on the pause between "bother", and "They're", and leapt onto the bed on "here". "Send in the Clowns" was Tigger's theme song. If I whistled the song, she would almost always enter the room between the "don't bother" and "They're here" with a nonchalant sort of soft-paw and a look that said "Hello, everybody, I just flew in from LA, and boy, are my legs tired!" Her other favorites included "The Mexican Hat Dance" song and "Me and My Shadow". The "Mexican Hat Dance" is whistled while I demonstrate the Scottish Cat Dance, which is similar to the Scottish Sword dance, except done with an (almost) sleeping cat. Tigger would remain calm and utterly relaxed while I tap my toes around her and eventually leap over her, while whistling "The Mexican Hat Dance", or sometimes the Campbells Soup Theme. "And when it's twelve o-clock, I climb the stair. We coulda taken this on the road a century ago. We'd a prob'ly had to. Tigger's comedic timing was always near-perfect. She was a vaudville ham in a former life. And she never lost her comedic touch. In her last week of life, she walked into the room where Carol and I were watching TV and settled herself onto a stack of tax documents Carol had been working with. She perched there in the classic Egyptian sitting cat pose and looked at us. Such a perfect pose, on top of a stack of important papers. I decided to get a camera. Left the room, got the camera, Tigger still sits. Aim the camera, set the zoom, set the focus, still sitting pretty. Depress the button, and in the half second before the shutter actually clicked, Tigger stood and stepped off the papers. 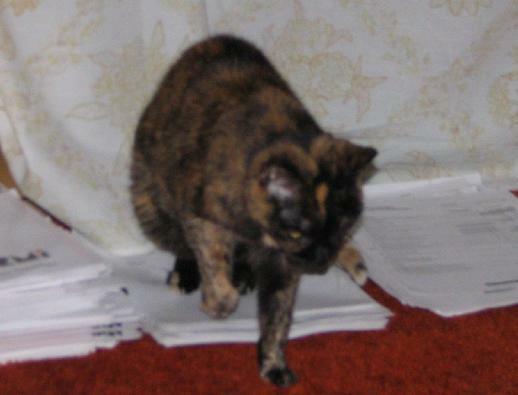 I have a photo of a cat walking off a stack of papers, instead of sitting on them. This was the last photo I took of Tigger. Carol and I laughed for several minutes at her precise timing and how well she suckered me. A year or so after Penny died, Carol announced that she was ready to consider a new cat. Within minutes, an acquaintance on a mailing list announced that she needed a foster home for her cat until she found new quarters where the cat could live with her again. 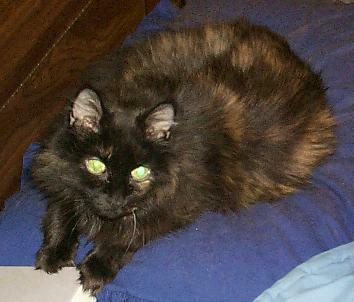 The new cat, Sarah, was another long-haired tortoiseshell, similar to Penny, though a bit darker. Carol and I promptly rechristened her Cinder, since neither of us liked the name Sarah for a cat, and Cinder was more descriptive of her coloring. Tigger could care less. Having learned from Penny, she made it plain that if Cinder never showed her face, Tigger would let her live. For a while. Cinder was a timid cat under the best of circumstances, and her life to date had not led her to expect anything good to happen, so she was resigned to a life circumscribed by the four walls of the bedroom, sleeping on the bed in the daytime, and on Carol at night. We moved food, water, and a litter-box into the bedroom for her, and she was content. She might have even been happy, though we could never be sure if she was really happy or not. The summer Carol's mom died was pretty trying for everyone. Carol spent several months in Chicago cleaning up the paperwork, while I drove various vehicles back and forth dealing with physical matters. Sometimes I'd spend the night at home, but more often I spent them in Chicago. Tigger stopped eating during this excitement and lost a pound or so. On an 11 pound cat, dropping a full pound is significant. Once we were back home, we expected her to be happy again, start eating, and gain back the weight. Instead, she lost more weight. At the same time, Cinder developed a large lump on her forhead. Around September, the cats got a visit to the vet. Tigger was as happy as she only got when she was going to visit the vet. As soon as she saw the kitty carrier, she bolted, and once we wrestled her in, she used extremely foul language. But, once the vet was done with the exam, Tigger got better news than Cinder. Tigger was diagnosed as having a higher-then-normal liver enzyme count, indicating liver problems, and potential kidney failure. The prescriptions was a special kidney diet, and no high protein treats. No Tuna! Tigger will starve! As bad as that was, the diagnosis for Cinder was less pleasant. She had a cancer in the sinuses. It was non-operable and guaranteed to be fatal within 6 months. We could take her to a place about an hour away for daily radiation treatments that would last for 6 months, make her sick as a dog, and might extend her life for 6 months. We decided to not extend her life with 6 months of hell. Instead, we put her on hospice style treatment. She got medications to reduce the swelling and pain, and plenty of scritching and love. Cinder hated getting pills even more than Tigger did. When she started hiding from us, even if we weren't going to dose her, we discontinued the medication, and just gave her petting and a warm place to sleep. When this wasn't enough, the vet's assistants came to the house with an injection for her and she went to sleep in Carol's arms and didn't wake up. While this was going on, Tigger was still losing weight, though not as fast. She was down to some 6 lbs in November when we graciously allowed her to go back to the vet's for an ultrasound examination. She spent an hour with a visiting vet, having her stomach shaved, greased, poked, and prodded while I held her back paws and Carol held the front. It was agreed that Tigger would put up with more manhandling from us than from the vet's assistant, and that we were responsible enough to put the cat through temporary hell to get an overall improvement in her health. Through the whole 45 minute procedure, Tigger gazed up at Carol, and trusted that if Carol were there, everything would be OK. The end I had wasn't quite so trusting, but she mostly held still despite having the electric-razor sized probe shoved into her stomach. The upshot of this was that there were some anomolies around her liver, and Tigger got to go back to the vet's for another visit, and this time she got to see the sharp side of a knife. Well, she would have seen it if she'd been conscious. Dr Tom did an exploratory abdominal surgery, removed some tumors from her liver, and noted that one kidney had failed completely, and the other was failing. He warned us that you couldn't tell how long a cat would survive once they developed liver and kidney problems. It could be two years, or it could be two weeks. The good news came a week later when the lab reported that the tumors were benign. Tigger's attitude was "'benign' my right whisker! Nobody cuts me open and calls it benign. Lets just say they weren't cancerous and leave out this benign stuff." She was pretty weak and sickly after the operation. And she was weak and sickly before it. That's why it happened in the first place. There's no such thing as minor surgery. She ended up with a pretty severe scar down her stomach that you could feel when you picked her up for over a year. Tigger got some medications to go with everything else, and a requirement that she drink a lot of water, and gain weight. The immediate problem was that she'd lost so much weight and wasn't eating enough. When a cat stops eating, their metabolism can shut down and it can be impossible for the animal to start again. Tigger had been eating so little for so long that her stomach had shrunken, and there was serious fear that if her metabolism had shut down she'd starve to death within a week. So, for a few weeks, she got all the nicest foods we could stuff down her, regardless of the protein levels. The high-calory/high-protein stuff might have been more stress on her kidney, but not eating would be fatal much more sooner. Dr. Tom sent us home with some A/D canned cat food that they described as "like liver pate". We stopped at the grocery and got some pure meat baby foods, like we'd used as treats for Penny after she got her daily insulin shot. The pure-meat baby food cut with Carol's chicken broth and heated to body temperature in a microwave was worth eating even when Tigger didn't feel particularly well. We called this "Gruel and unusual Nourishment". Tigger called it about time. 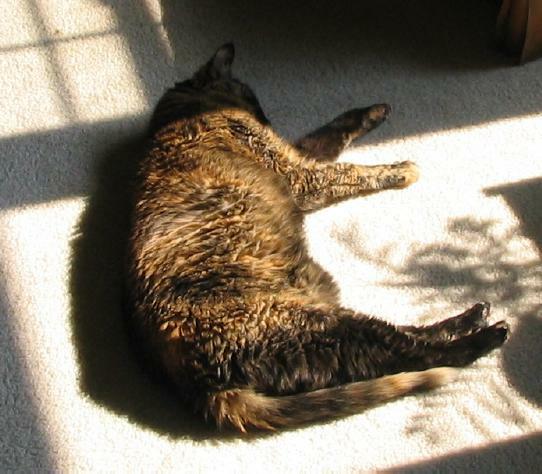 After she started gaining weight we cut down on the high-protein snacks and fed her the Purina Kidney diet. She only got treats after she got her twice-a-day medicine doses. This started what turned out to be the last three golden years for Tigger. She'd get a dose of medicine in the morning, and then a teaspoon of tuna to help the medicine go down. 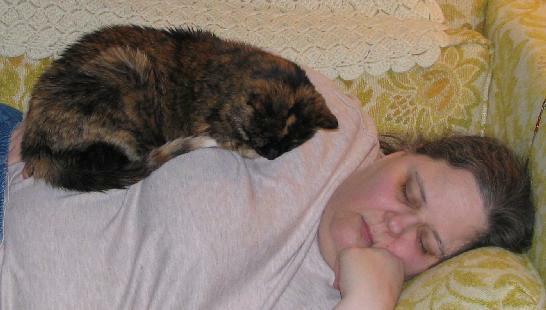 Then a nap, some petting and human-time, and another evening medication, and go to sleep on Carol. The back of the green chair was one of Tigger's favorite places when she expected to be scritched. If no scritch was in the offing, she'd sleep on one of the cat pillows Carol picked up. 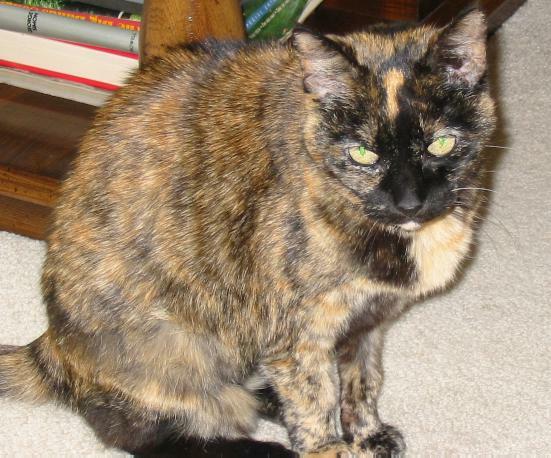 Anything warm was fine with Tigger, she loved to sleep behind the brown chair, next to the warm-water baseboard heat radiator or sprawled out in the sun. During the last year, when she seemed to be less comfortable, Carol wrapped an electric heating pad in a towel, and let Tigger sleep on that. 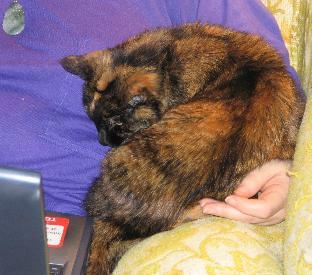 With a heating pad underneath her, and a warm, arm-shaped, pillow, Tigger was a contented as a cat could get. If nobody would lie down for her, Tigger would be content to settle in Carol's arms while she played computer games. Tigger never quite figured out why humans seemed to enjoy these games, but she kept watching, and maybe someday she'd figure it out. Tigger gained weight slowly, and finally got back up to almost 9 pounds. We changed her medication every few months, and finally ended up with 1/4 tablet of commercial Pepcid, 1/4 tablet appetite enhancer, 0.35 ml of ursadiol, and 0.5 ml of metacloprimide every day, with a half tablet of prednisome added on alternate days. Tigger turned out to be extremely adept at spitting pills into a corner when we thought she'd swallowed them. We finally borrowed a mortar and pestle from a friend, ground the pills to powder, added the liquid, and slurped the slurry into a syringe (no needle) to shoot into her mouth. We referred to the mix as the "Slurry with the Syringe on top". Tigger used less polite terms to refer to this. For a while, she got a half pill of the apetite enhancer. She did not like this at all. She would drool and foam, and try to hide when she saw us prepping the morning dose. When we cut back to a quarter pill, she still didn't like it, but she didn't drool and stopped fighting the dose. She never avoided us when we weren't going to dose her. She'd be underfoot in the kitchen right up until she realized that we were prepping her medicine, and then she'd walk casually out of the room and hide. At that point, we'd set the medication aside and eventually, she'd come back out, get her dose, sulk for a short while and then eat her treat and be underfoot again. In December 2004, Tigger started losing weight again. It looked like we might be saying goodbye. We were worried that her kidney was starting to go. The vets suggested we try giving her a poor-man's dialysis treatment. A subcutaenous injection of about 100 ml of Ringer's solution when necessary. We started doing this on days when she vomited, and Tigger started stopped losing weight and started gaining again. Over a few months we went from once a week to daily injections. At first Tigger disliked the sub-Q treatment, but once I got the idea of warming the solution, and Carol decided to warm it even more, Tigger came to look forward to the evening "douse". Every night, we'd fill a big saucepan with water as hot as it comes from the tap, put in a bag of lactated ringer's solution, and wait 15 minutes. When the water was warm, Tigger would get about 100 ml, subcutaneously, and then another spoonful of tuna. Tigger actually liked the 'douse' (to distinguish it from the 'dose' of medicine). I think the warm water made her feel good. Sort of like wetting your pants in a dark suit, but on the inside. Of course, the mylar-bagged tuna (or salmon, or sometimes shrimp, or the organic cat food) treat didn't hurt in the least. Most often, we'd open a 5 oz. bag of seafood for Tigger, feed her treats for a few days and then I'd eat the rest before it went bad. Carol didn't care for me telling folks I was being fed left-over cat food, even if it was true. I didn't need to worry about any iodine deficiency while Tigger was getting treats. 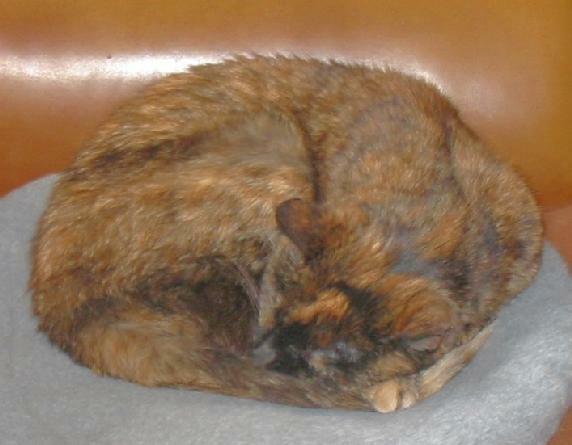 We ended up with Tigger getting her 'dose' in the morning, about 10:30, and her 'douse' in the evening, again about 10:30. About 10:00 each evening, Tigger would come to wherever Carol and I were working and stare at us. We'd tell her she still had a half hour, and she'd go away, and 5 minutes later she'd be back; "Is it time yet?". We referred to the stare as "j'accuse", but sarcasm was always wasted on Tigger. Once we succumbed to the pitiful eye, and headed for the kitchen, Tigger would trot along behind, ever hopeful that she'd get more tuna than usual. I'd spread a folded blanked on the floor, and Tigger would promptly take her position on the corner. She'd wait patiently (once the prep was started) until I had the bag of saline solution hung on the plant-hook above the sink, put in a sterile needle, and run enough saline through to get the cool water out of the line. Then I'd sit down, and drag her from the corner of the blanket to the center, between my legs, and poke her with a needle. Putting the bag on plant-hook above the sink gave us almost 6 feet of head. We used an 18 gauge needle, despite Tigger's objection when we got one that wasn't as sharp as the others, or Carol or I needed two tries to get the needle in right. We tried a 20 g. needle and while it went into Tigger easier, the flow was enough slower that Tigger would start to fidget before we had the 100 ml into her. With 6 feet of head and an 18 g needle, the douse only took a few minutes. This was well within Tigger's attention span. 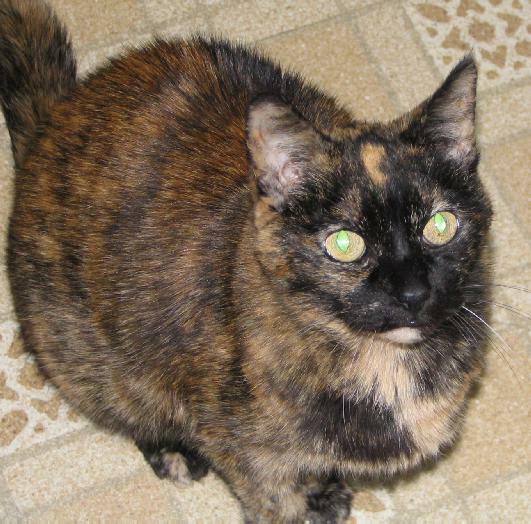 Given that Carol was usually preparing Tigger's Tuna Treat (with Tigger carefully supervising from the floor, with big round eyes), there was a limit to how long she was willing to sit still. 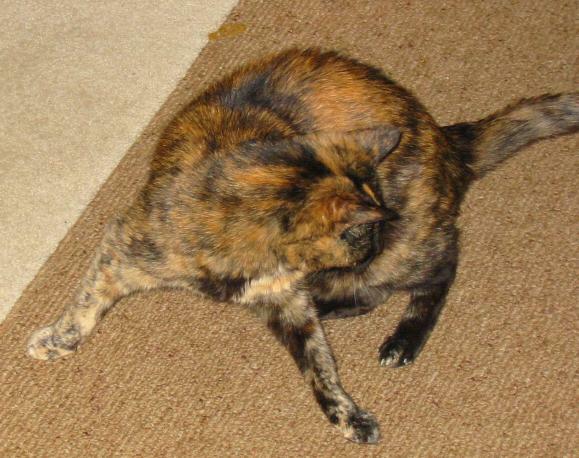 Tigger would crouch in a Sphinx pose and purr while I gave her the douse. She'd stay quietly and keep purring while I stroked her to spread the solution (and gently hold her in place) until Carol made a motion that looked like putting the treat dish onto the floor. Then Tigger was all ready to leave. Now. Why she thought that getting under Carol's feet or putting her head between Carol and where the food dish was heading would get her a treat sooner is something only Tigger knew. 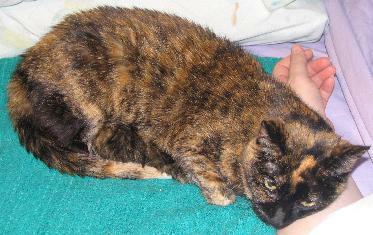 In December of 2005 we noticed that Tigger's urine was getting a pinkish cast, and she stopped eating much of her dry food. She dropped to 8# 3 oz, and we made an appt for her to go to the vet for a checkup in early January. The good news was that her blood enzyme levels were almost those of a completely healthy cat. For a cat of her age, they were just about perfect. Evidently, the daily dousing and medications were doing the job just fine. Dr. Karen thought Tigger had a bladder infection (thus the blood in the urine), and it was obvious that she had a sore in her mouth (thus the non-eating). Tigger went home with a 10 day supply of clindamycin liquid, to be taken twice a day, and an appointment to return for a follow up checkup in a couple weeks. With the sore in her mouth, Tigger couldn't eat the normal hard, dry food, so we started feeding her canned K/D, canned A/D, fancy organic canned cat food, and her usual tuna and salmon treats. This was enough nice food that she'd almost forgive us for the clindamycin, which seemed to taste terrible. Actually, she did forgive us. She'd sulk for a few minutes after her antibiotics dose, but then she'd be back in a lap, underfoot, and face-first in the treat, just like normal. If Carol and I headed for the kitchen about 10:30 at night, Tigger would trot ahead, head high, and tail higher. One eye on the refrigerator and the other on her treat dish, checking over her shoulder to be sure we were following, and she'd get her douse and treat. 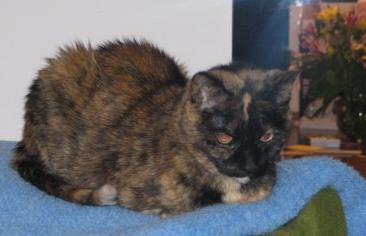 After the clindamycin was done, Tigger still wouldn't eat the dry food, and wouldn't let Carol check her teeth. We called the vet's office, and they suggested we bring her in for a tooth cleaning and a more thorough oral exam. The problem was likely to be an absessed tooth, which they would pull. When Tigger went in to the vet's office for her teeth cleaning, I was in DC. Carol dropped Tigger off, and then went home, to come back when Tigger came out of the anaesthetic. About a half hour after Tigger's appointment started, Carol got a phone call. Tigger didn't have an absessed tooth after all. She had bone cancer. The teeth were sitting in very little bone. Dr. Karen told Carol that Tigger had been in pain, and the kindest thing to do was just not let her wake up. She was sleeping now, just let her go in her sleep. This wasn't the death we'd planned for Tigger. We'd expected that she'd die at home, wrapped in a towel, being scritched by me, and held by Carol while she went to sleep. Instead, she ended up in the place she liked least (the vet's office) and a cold, hard, antisceptic table. 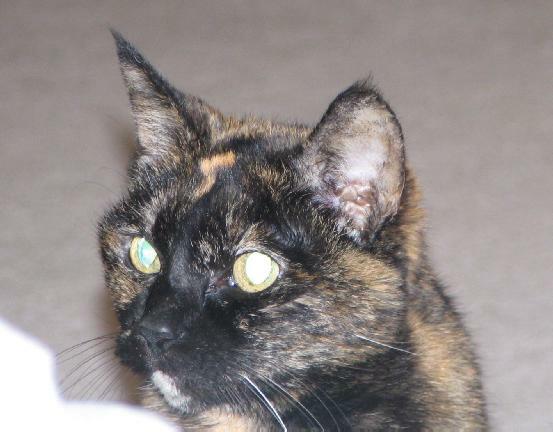 When Carol got the call from the Dr. Karen, she called me, and we discussed whether it was any sort of favor to Tigger to bring her home for a day of treats, pain, post-anaesthetic nausea, one last night of sleeping with Carol and then a final visit for a somewhat less unpleasant death. We decided the kindest thing was to just let her sleep, and Carol went in to the vet's office to pet Tigger in her sleep, as she went into the big sleep. Tigger may not have been awake to enjoy the scritch, but I think she knows it was there. Every animal is unique, and every pet is special. They all have their own little tricks, quirks and bits of personality that make us love them. Tigger was a bit more special than most. Quite doglike in her willingness to behave, be affectionate and playful up until the very end. And, of course, the perfect comedienne: always leave them wanting a just little more.